The first patients have been treated at the newly opened proton therapy centre at the Christie hospital in Manchester, UK. It has been reported by the BBC that fifteen-year-old Mason Kettley, who has a rare brain cancer, will be amongst the first treated. This facility is the first of its kind to treat cancer patients with high energy protons in the UK. Previously, patients needing this type of treatment had to go abroad. Proton therapy targets cancer cells without damaging the healthy tissue around the tumour. This is particularly important when treating children. The type of tumour Mason has cannot be operated on because of a risk of blindness and other complications. 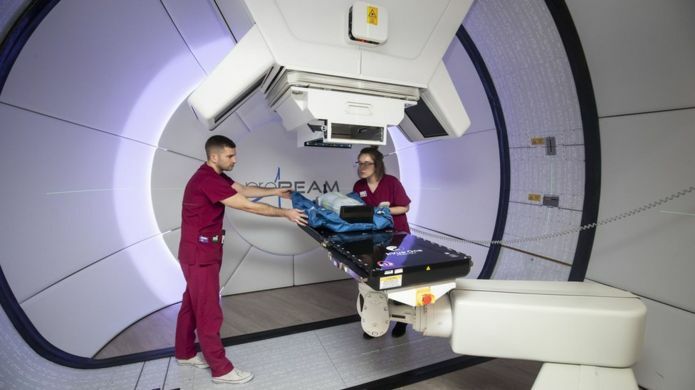 The Christie hospital centre which opened in autumn 2018 is one of two new high energy NHS proton beam therapy (PBT) centres which will be operated in the UK, the other centre being at the University College London Hospitals. In addition, several private treatment facilities are expected to open over the next few years. Research within the Cockcroft Institute/University of Liverpool-led OMA project aims to improve PBT facilities through research carried out in close collaboration between partner institutions across Europe, including the Christie Hospital. OMA covers research on Beam Imaging and Diagnostics, Treatment Optimization, as well as Facility Design and Optimization as its main work packages, all aimed at enhancing cancer treatment using ion beams. There are two OMA Fellows based at the Cockcroft Institute who both work on projects aimed at improving PBT. OMA Fellow Jacinta Yap is conducting research to develop instrumentation for detailed characterisation of the treatment beam at the Clatterbridge Cancer Centre. This is expected to give a better insight into the beam, lower the time required for quality assurance measurements and provide additional safety features. OMA Fellow Ewa Oponowicz is working on ways to improve proton tomography at the Christie centre. This is a new method which is expected to help reduce patient imaging errors. Her research project is based on the design of the beam optics of a superconducting isocentric gantry for proton therapy and computed tomography. It has the potential to reduce the size of the beam transport system guiding the ions to the patient and hence the overall cost of the facility, as well as allowing for more flexible beam delivery from various angles.